Over the centuries, the art of music has developed a rigorous set of rules and best practices that lead to the most pleasing and effective aesthetic results. Because of the highly structured nature of music, it can serve as an excellent paradigm, or model, for many other areas of human activity involving organized interactions between its component elements. For example, people, corporations and nations interact according to specific laws and regulations, and the rules of interaction between notes and chords within a well organized composition can provide an excellent means of visualizing the ways in which any change in one element leads to a chain reaction of changes in all the other elements in the system. While the natural world has imbued all living creatures with the instinct of competition, and therefore a constant conflict over territory and resources, mankind has the potential to transcend this self-survivalist approach, and assert the principle of cooperation. While cooperation is certainly present in nature as well, it is usually at the expense of a rival species, and the ultimate balance is achieved through the harsh law of "survival of the fittest". Through man's superior intelligence, optimal solutions can be devised for creating win-win interactions. Such solutions are based on a full and accurate understanding of the rules governing these interactions. Provided the rules of interaction are correct, music helps us understand how the different "moving parts" can work together in harmony. 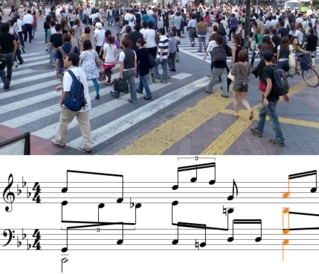 Individual melodies can have independent narratives that overlap and interact with numerous other individual melodic narratives. As the number of melodic narratives increases, like a growing society of political parties and beliefs, so too the subtle balance between the different threads in the musical tapestry, which become finer and more delicate, and subject to ever greater care and attention. The realm of Western music, like the realm of Western society, has developed an elaborate set of theories, rules and guidelines which can lead to optimal results, but the implementation of so many rules has become complex and difficult to apply.